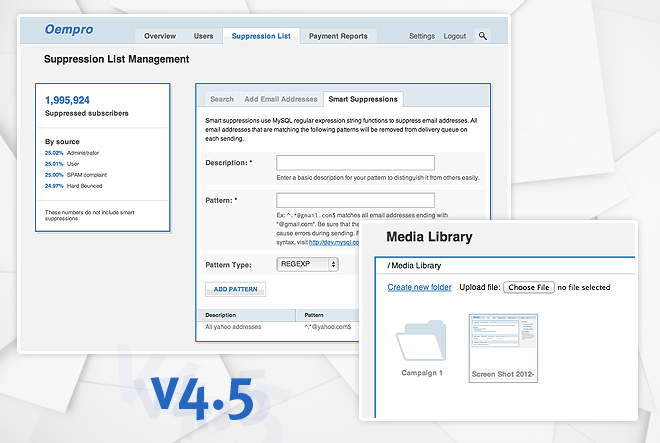 After two months of the v4.4.1 release, we are happy to introduce the release of Oempro v4.5 update. This update includes a series of new features which are explained below. We strongly recommend everyone to update their Oempro to this latest version for maximum stability and new features. This is a new feature added for ESPs and agencies. Now, administrators can manage the global suppression list for their customers. Administrators can suppress a specific email address, or a whole domain (smart suppression such as *@hotmail.com). Administrators can also see suppression statistics of the system. You can now enable or disable this feature for the whole system. Image embedding is a heavy-load feature which may cause huge loads on the mail server and bandwidth. Therefore, it’s usually something which is not preferred by ESPs. Now you can disable this feature through the config.inc.php file. In previous Oempro versions, you would be able to personalize only a specific string based on conditions (ex: Dear Mr. Smith, Dear Mrs. Smith). But now, you can personalize a whole content block based on conditions. For example, you can display a BMW, Audi or Mercedes logo, picture and content based on recipient profile. You are almost limitless on customizing and personalizing your email content based on recipient profiles. Converts string to title case. User accounts can manage their media files (images, etc.) through the new media library. They can create folders and put media files inside. They can also access the media library through their control panel without the need of creating an email campaign. This was one of the most requested features in the past few months. We added an option to the config.inc.php to change the domain of the message-id email header. Addition to this new features, there are lots of improvements and some bug fixes. For the detailed change log, please take a look at Oempro v4.5 change log page. When I take a look at our Oempro version release log, we have released an update every two months this year. And now, we are going to focus on Oempro v5 development and we will do our best to release it before the end of 2012. In the meantime, we will continue maintaining Oempro v4.5 release. Thanks for all those valuable feedback received from our customers. Oempro is a powerful, full featured email marketing software which can be used for all kind of email marketing activities and for building successful ESP businesses. It’s great to see hundreds of ESPs all around the world using Oempro to make money and provide high-quality email marketing software to their customers. We will continue to keep Oempro #1 in this market and make it even more powerful for your needs.